I’m asked quite often what I think the best taco truck in LA is. I wouldn’t know where to begin and there are so many I have yet to try. 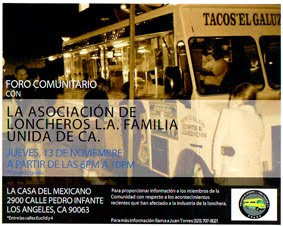 But if I had to choose one taco truck to represent LA and say , here this is an LA street taco, it would be El Chato. El Chato does it right. These tacos are beautiful little bombs of flavor that come on your plate hot and greasy topped with grilled onions and chiles. The tacos are the size of the inside of your palm and can be devoured in two bites, maybe one. 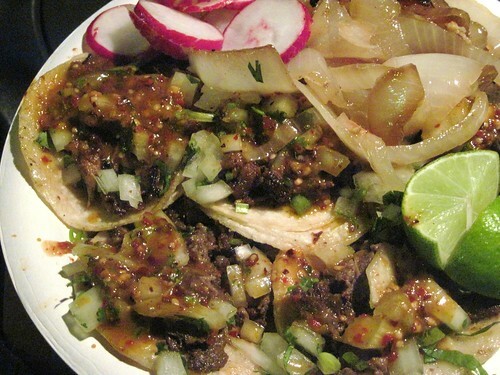 They are some of the most addictive tacos in LA. I once ate 8 of them in one sitting and wanted to go back for 2 more. The al pastor is cut from the spit and grilled on the plancha alongside asada, chorizo, buche and lengua. The salsa is made with chile arbol and tomatillo. It’s reddish- orange in color and has a nice smoked chile flavor to it and if the spice isn’t enough there’s that grilled jalapeno pepper to chomp on to raise the heat level. At some taco trucks I pace myself and just order a couple tacos but when I’m at El Chato I have them load up that plate with at least 5 tacos, sometimes 6. I ask for an extra jalapeno and alternate between bites of jalapeno and taco and wash them down with either a bottle of jarritos or horchata. If you see a line and you almost always will, don’t worry, the crew at El Chato is incredibly efficient. With as many as 5 people working in the wagon it can look claustrophobic at times but they all have their own duties. One takes the money, another mans the grill, another the tortillas, another garnishes the tacos. It’s impressive to watch them handle a large crowd and get the orders out relatively quickly. 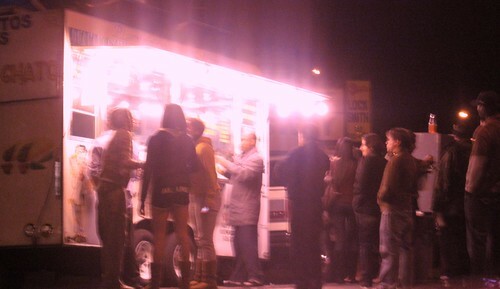 El Chato is one of those taco wagons that people come from all over to eat at. 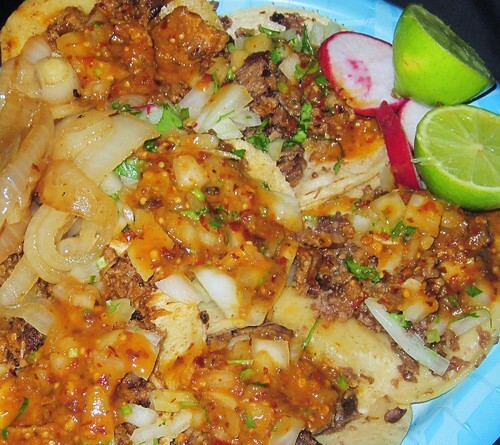 On my last visit I spoke to a couple who had drove from Sherman Oaks for their El Chato fix . They are regular customers and make the trip over the hill a few times a month. 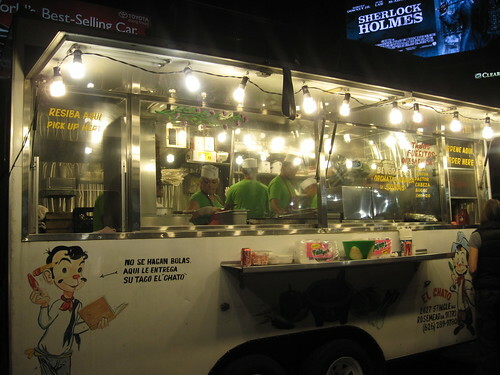 From 8:30 pm when the first order is usually taken to 1am on the weekdays and as late as 3am on the weekends the corner of La Brea and Olympic is where you will find some of LA's best street tacos. The finely cut meat,onion, and cilantro, the spicy chile salsa,the way the tacos fit in your palm and beg to be devoured whole. These tacos may have their roots in Mexico but their identity is Los Angeles. They are tacos estillo LA. We tried to go to this truck last night, but miscalculated - we went by at 8:00 and it was still closed. You've scooped me, rival taco journalist! Now I want to go to El Chato more than ever - it looks to be one of LA's finest. I'm glad to know I should order a large quantity of tacos. You must try el chato asap.They arrive at around 8 but they don't swing the doors open until around 8:30. The best Taco truck in the city for sure ! Love El Chato ! EL CHATO HAS GREAT TRIPAS TACOS AND THAT IS IT. The salsas are OK at best, just like the rest of the menu – the Al Pastor tacos are especially bland, I don't know if everyone is just drunk when they eat here and thats why they love it so much but aside from the Tripas this place is just OK.
For a real-tasting Al Pastor taco you have to start with El Taurino / Go there and try an Al Pastor taco with red salsa then I dare you to say "El Chato" is so great. Well my name is mike and I work for el chato. I'm the one with the insane tattoos. I'm gonna put it simple, I've been working here for 3 years and I still can't enough of it. They are by far the best damn tasting tacos ever!!!!!!!!!!!!!!!!! You want quality and authenticity when you put food into your stomach don't you? Then come to el chato and get the best $1 TACO YOU WILL EVER EAT!!!!!!!!! We go to El Chato alot. I've been missing serious tacos from Mexico, and have had almost-as-good ones in San Diego and other places in California, so thought I'd start on a taco hunt in LA. Since El Chato was rated the highest truck that serves al pastor, why not start here? Definitely not the best al pastor, and not even close to any average al pastor I've had. Yes, the meat comes off of a spit, but then it's chopped up so much that all the juices and flavor is cooked away. All it tasted like to us was ground pork and spicy salsa. I was happy to see that it was only $1 tacos, but I just ordered two to sample. It still took a long time to get my two tacos (felt more sorry for the guy who waited about 20 minutes for his one taco), so after I finished and was still hungry, I didn't want to wait again so we just left. Their al pastor is whatever but their carne asada is pretty damn good. One thing though, their tacos are smaller than normal. I can eat 10 of those and still have room for more. Their carne asada tacos are pretty good but they are so small I need to eat about 15 of them to feel satisfied. Their al pastor, not so good. I hate to say it but I think this truck is desperately overrated. Tacos Leo is a few blocks away and has superior meats, bigger tacos, faster service, and longer hours. Their lengua is the best taco on planet Earth. Period. BEST TACOS IN LA!!! I ALWAYS ORDER 7 0R 8 EVERYTIME I GO. BELIEVE ME WHEN I SAY THESE ARE THE BEST TACOS IN LA FOR SURE. I ORDERED 10 AT A TIME.